Although debt is available from banks and alternative lenders, we find that many developers are not aware of the options available to bridge the gap. In some cases, developers already have relationships with investors, and they just need help to approach them in the right way and formalise the arrangements. Other clients need guidance on how to raise awareness of their projects and attract new investors, without getting in trouble with regulators such as the UK’s Financial Conduct Authority. This report sets out 5 of the most popular structures used by developers to raise capital from private investors. It is distilled from our lawyers’ experience of working on investment structures for over 20 years. Other variants and options are available, and in practice each structure will need to be tailored to the needs of the developer and investors involved. To download your free printable PDF version of this report click here. 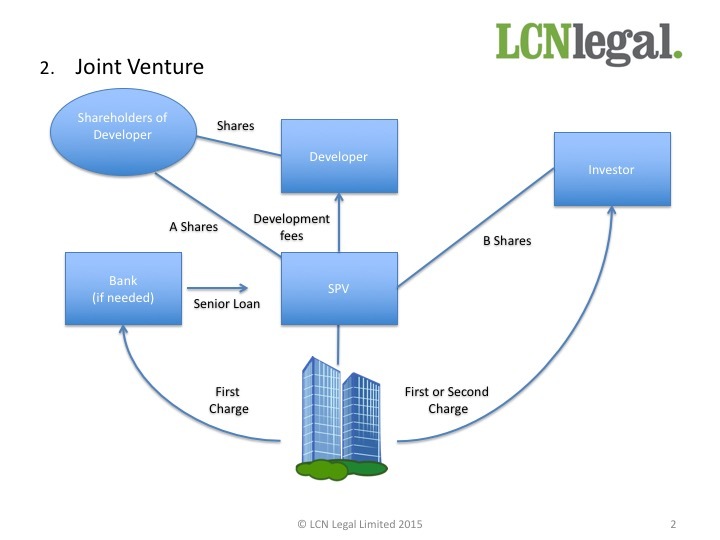 LCN Legal is a UK law firm which specialises in corporate and investment structures. 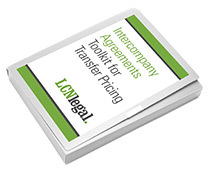 Our specialist lawyers often write training materials for lawyers in other firms, and we contribute to respected publications such as LexisNexis and Practical Law. We work alongside tax advisers to design and implement structures, and we guide our clients through the process of attracting investors. The property is held in a special purpose vehicle (SPV) which is owned and controlled by the developer. The developer contributes equity into the SPV. This can be a combination of shares and loans. Senior debt may be provided by a commercial lender. This is secured by a first charge over the property. 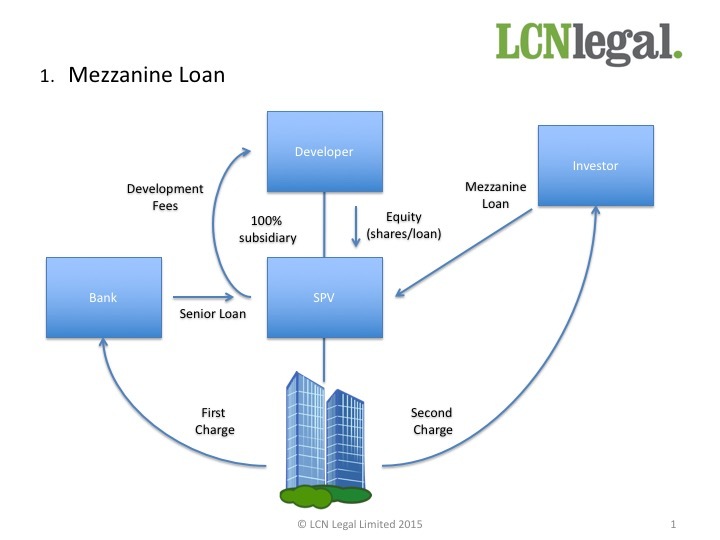 The investor provides funding by way of mezzanine loan, secured by a second charge which ranks behind the bank. The developer provides development services to the SPV, and receives fees. The property is held in a special purpose vehicle (SPV) which is jointly owned and controlled by the developer and the investor. The relationship between the developer and the investor is governed by a shareholders agreement and by the SPV’s articles of association. The developer and the investor often hold different classes of shares in the SPV to reflect their different economic and control rights. The key individuals of the developer may hold shares in the SPV directly, so that they can benefit from entrepreneurs’ relief on the sale of the project and the winding up of the SPV. 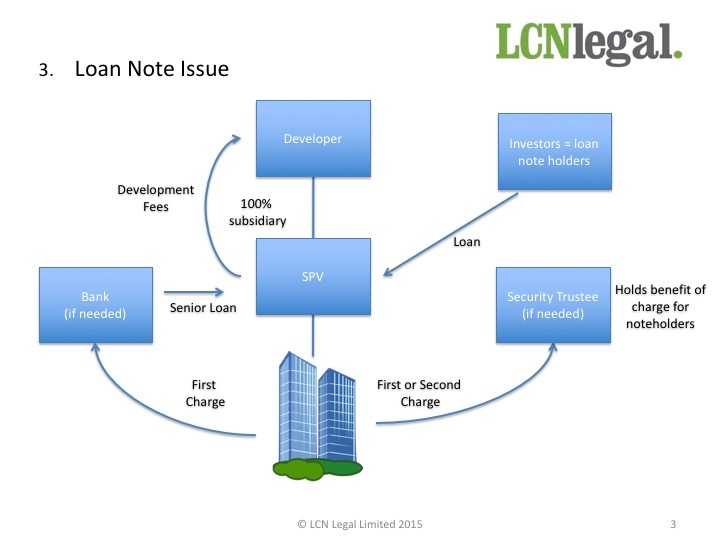 The investor provides funding to the SPV by way of loan, secured by a second charge which ranks behind the bank. A number of investors investors lend money to the SPV on the same terms. They do this by subscribing for loan notes issued by the SPV. The loan notes are secured by a second charge which ranks behind the bank. An independent party may act as a “security trustee”, to hold the charge for the benefit of investors. The property is held in a special purpose vehicle (SPV) which is owned and controlled by the developer and a small group of investors. 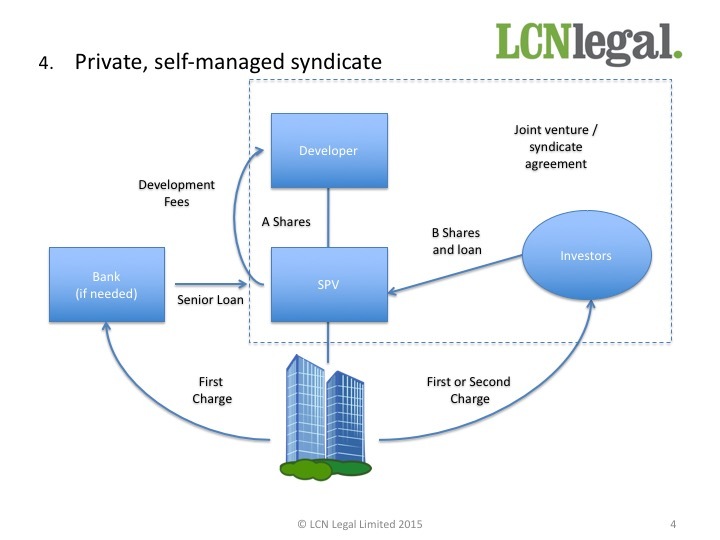 The relationship between the developer and the investors is governed by a syndicate agreement or shareholders agreement, and by the SPV’s articles of association. The investors provide funding to the SPV by way of loan, secured by a second charge which ranks behind the bank. The developer appoints a crowdfunding platform which connects the SPV with a large number of investors. The developer also appoints a corporate finance adviser, who helps the developer/SPV to prepare for the offering. 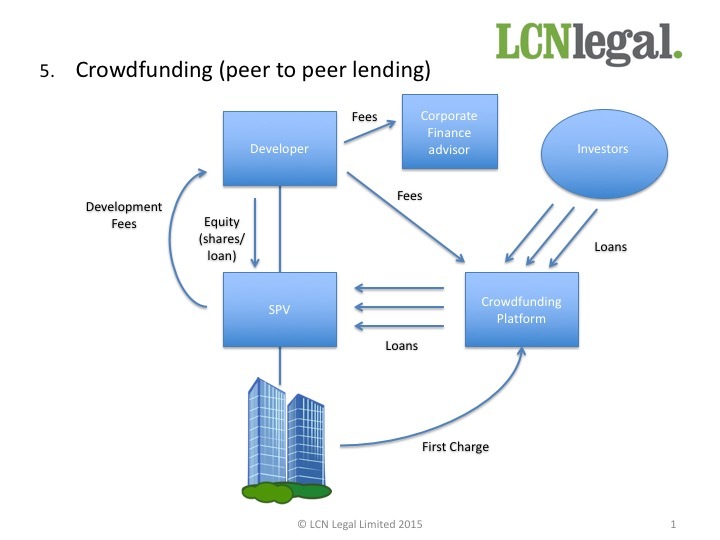 Investors make loans to the SPV through the crowdfunding platform. The loans are all on identical terms, and are secured by a second charge which ranks behind the bank. The crowdfunding platform monitors ongoing compliance with the terms of the loans.